Eric and I got a madeleine pan as a wedding gift, and, of course, being a literature-obsessed girl, I could not live without the world’s most literarily famous cookie (Proust, lime tea, madeleine: memory). When the hankering hit me, I knew Dorie was the right lady to go to for a recipe. These baked up with a perfect hump, a light crumb, and enough lemony tang to wake you up in the morning. In a word, they are delightful. 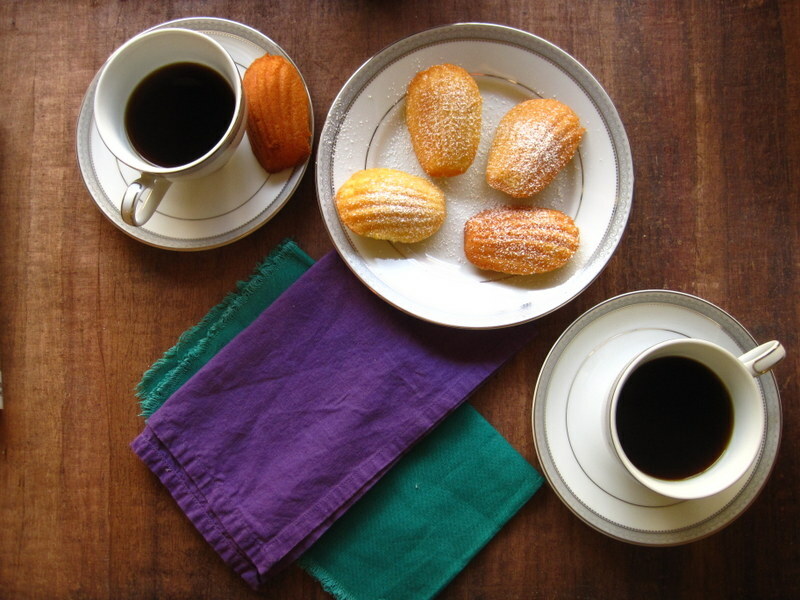 Madeleines are really more of tiny sponge cakes than cookies, but I have no problem with that. I am an equal opportunity eater, especially when this much lemon zest is involved. 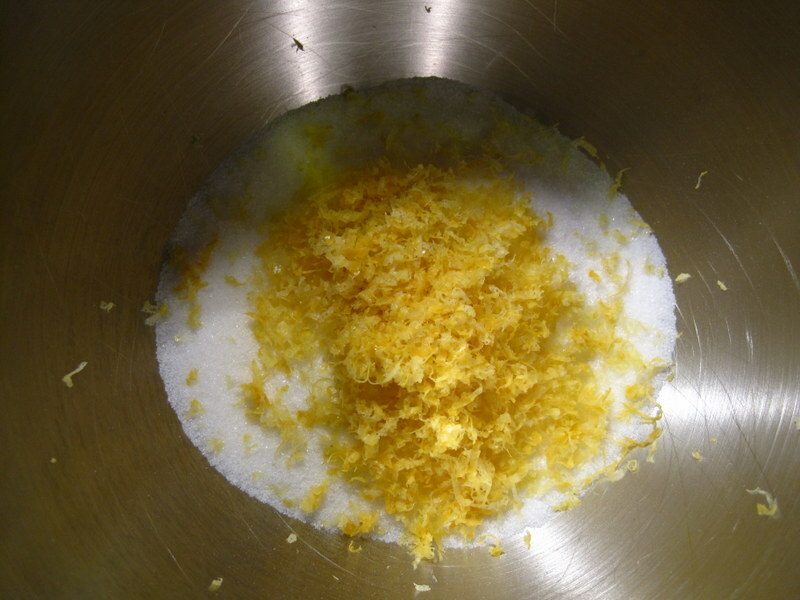 Dorie taught me how to work the zest into the sugar by hand, and it makes all the difference. I doubled the recipe so we could have plenty on hand. That was a good move, it turns out, because I ate about five of them fresh out of the oven. They’re (relatively!) small! And I was hungry. I was really happily surprised at how easy these were to make, and how well mine turned out. I think the secret is in chilling the batter. Thanks, Dorie! -Whisk together the flour, baking powder and salt and keep close at hand. -Getting ready to bake: Center a rack in the oven and preheat the oven to 400 degrees F. Butter 12 full-size shell-shaped madeleine molds (or up to 36 mini madeleine molds), dust the insides with flour and tap out the excess. If you have a nonstick madeleine mold, give it a light coating of vegetable cooking spray. -Spoon the batter into the molds, filling each one almost to the top. Don’t worry about spreading the batter even, the oven’s heat will take care of that. 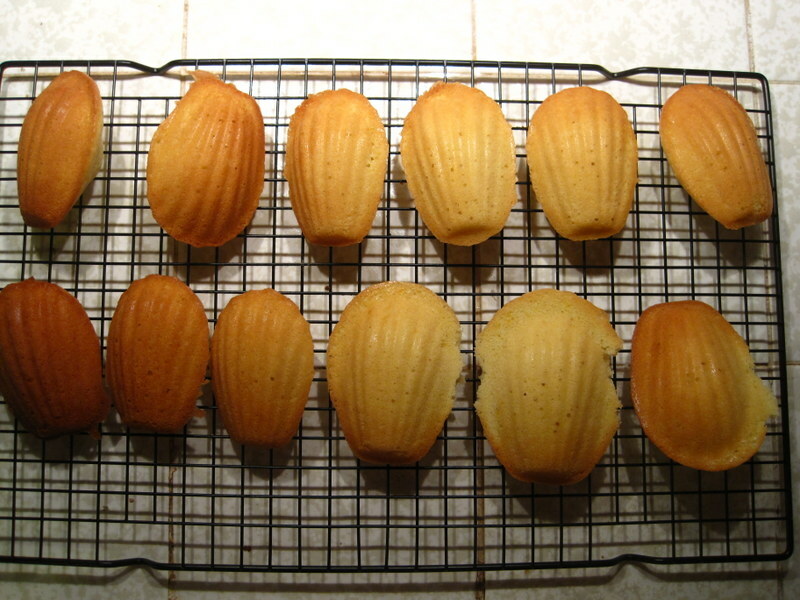 Bake the large madeleines for 11 to 13 minutes and the minis for 8 to 10 minutes, or until the madeleines are golden and the tops spring back when touched. Remove the pan from the oven and release the madeleines from the molds by rapping the edge of the pan against the counter. Gently pry any recalcitrant madeleines from the pan using your fingers or a butter knife. Transfer the cookies to a rack to cool to just-warm or to room temperature. -If you are making minis and have more batter, bake the next batch, making certain that with each new batch the pans are cool and properly buttered and floured or sprayed. -Serving: The cookies are ready to serve when they are only slightly warm or when they reach room temperature. Dust the tops with confectioners’ sugar and serve the sweets with tea or espresso. 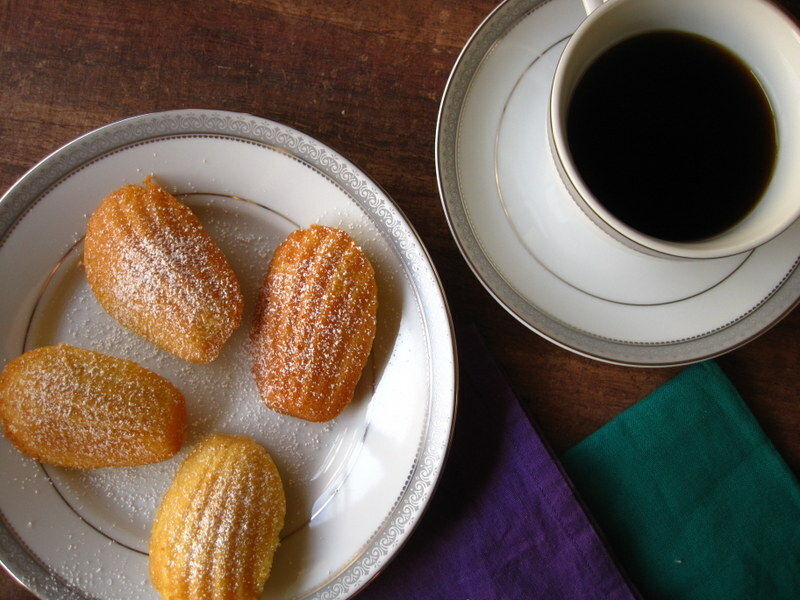 -Storing: The batter can be covered with a piece of plastic film pressed against the surface and kept in the refrigerator for up to 2 days, but the madeleines should be eaten soon after they are made. You can keep them overnight in a sealed container, but they really are better on day 1. If they must be kept, wrap them airtight and freeze them, they’ll keep for up to 2 months. These look so pretty. And, yes, Dorie is the belle dame of sweet things, especially French sweet things. Hello from the depths of Doe! You are too kind, my friend. 🙂 It still feels so far away that I can barely allow myself to dream! Ah, how well I know those depths! But dream you must, my friend! All too soon it will be behind you! Oh, these look sooo yummy! I LOVE madeleines. Maybe because they look so elegant? Katy, hang in there–sending love and encouragement. You can do it! You are so sweet! I will make them for you next time you come!